As The Ogden in downtown Las Vegas transitioned from a rental property to condominiums, the property’s new ownership team made the decision to revitalize and update all public spaces, including the lobby and hallways, as well as all models and a common outdoor areas. The goal of this makeover was to reflect the new vibrancy of the iconic downtown tower. Interior Designer Lee Bryan of LBID, LLC in Atlanta was engaged for the job because of his impeccable track record of infusing new life into residential projects across the country. LBID has created distinctive residential and commercial spaces for more than a decade throughout the country as well as internationally. The company is known for its vast and up-to-date knowledge of materials, technology and furnishings, all of which were implemented in its design work at The Ogden. “With each model we refreshed. The goal was for it to look as though someone actually made the condo their home with items and artwork that would have been collected over the years,” Bryan said. LBID initially designed three models that were so well-received, the company was asked to create three more home designs for the property’s remaining models. “When people are shopping for a home, they are more than likely hopping from one property to another, seeing many in one day. The home they are going to remember is the one that stood out, the one with attention to detail and unique, personal touches,” Bryan said. Homes at The Ogden range from a one-bedroom, 815-square-foot residence for $229,000 to a three-bedroom plus den 2,044-square-foot home for $629,000. 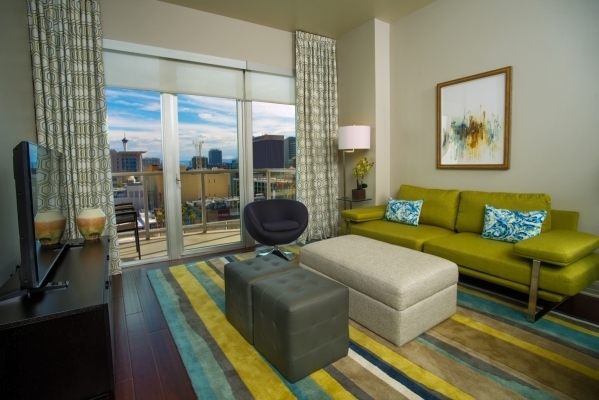 Residences feature a modern design aesthetic in keeping with the architecture and the lifestyle vibe, with private balconies and expansive views of downtown Las Vegas, the Strip and the mountains that frame the valley. The Ogden’s single-story, open floor plans offer flex spaces that can serve as a home office, den or yoga room, extra bedrooms for accommodating multigenerational family and guests, and spacious windows that fill interiors with natural light. For more information, visit The Ogden’s onsite sales center at 150 Las Vegas Blvd. North or online at Ogdenlv.com.